With the second season of the Legend of Korra about to begin broadcasting, I thought it would be a good time to rewatch the first season to get up to speed ready for the new stuff. In November last year, I reviewed the series, and frankly I wasn’t too impressed with it at that time. Upon second viewing, though, I have come to re-evaluate my assessment. Here I’ll go through my previous concerns and look at them again, and below that I’ll add new insights and feelings. Be warned: this contains spoilers for Legend of Korra book 1 and Avatar: The Last Airbender. My original complaints over the Equalists is that the non-benders are in fact being oppressed yet nobody does much to try to combat this; the writers had introduced the possibility of moral complexity, and then continued to treat the issue in black and white. The Equalists are clearly terrorists. Amon does not peaceful equality, he wants to harm people by taking away their banding – for many their livelihoods – to put everyone on an artificially level playing field, with him the sole remaining bender. The means he chooses to achieve this end are certainly terrorist acts – including an attack on a major sporting event and later bombing the city indiscriminately. He kidnaps the last guardians of an ancient culture and threatens to take away that which enables them to maintain that otherwise lost culture, their air bending. These are not the actions of a freedom fighter, but of a terrorist. Yet it is clear that there is a problem in Republic City where benders have a distinct and unfair upper hand compared to non-benders. Bending crime gangs have protection rackets and threaten to destroy non-benders’ hard work unless they are paid. There is no non-bender on the Council at the time of the events of the show (though it seems there was a non-bending air acolyte on the Council some thirty years prior – see the flashbacks in episode 9). There is no voice, therefore, for non-benders at governmental level. Tarrlok makes this worse by imposing a curfew on non-benders. Non-benders are clearly treated as second-class citizens. This is why so many of them rallied behind Amon. Yet the Council sleepwalked right into this state of affairs; it can’t possibly have just snuck up on them. They must have repeatedly failed to act to prevent Amon’s rise to power. Hardly what one might expect of Aang’s son, let alone the rest of the Council – who are presumably some of the most influential people in the city. So there’s a big disconnect here. In fact I’d say this is a bigger problem that I even realised ten months ago, because look: the good guys are the oppressors, or complicit in the oppression; the bad guys are the oppressed. This is a narrative from a position of privilege which almost completely fails to acknowledge that the oppressed are indeed oppressed, that their cause, if not the methods of the supposed leader of the movement, has its roots in the Council’s failures to listen to them, and the police force’s failures to combat the huge organised crime problems the city has. It is a dismissal of a very serious problem, because there’s one guy running around blowing things up and mutilating people in the name of the oppressed. And stories like this can have an impact on the real world, by cementing the view that the oppressors shouldn’t have to share rights with the oppressed because the oppressed are all terrorists out to harm them, which isn’t true by any stretch of the imagination. So in this, the writers chose a problematic subject matter for the core of the story’s conflict, and then failed to address it fairly and without bias by flattening all the shades of grey. I realise that, in terms of plot, they needed something that could be told in just 12 episodes, but perhaps this core conflict wasn’t the right choice, or maybe they should have found the space to give the non-bender side of it more strongly. I should note here that the one non-bender on the core team, Asami, is herself in a position of privilege because she is from a rich family and so she hasn’t had to experience some of the problems of inequality first hand. She is not a typical representative of the non-bending population (and neither is Pema). So the problem with the Equalists remains a big gripe I have with the show. It was far too rushed. There was potential, at the moment when all of the characters had fled, when Team Avatar were living in the sewers, Tenzin and his family were who knows where, Lin Beifong had been stripped of her bending and Iroh had lost his fleet. There was potential at that point for the characters to claw their way back to victory through hard work and incremental gains. Instead Korra and Mako run off to confront Amon while Bolin, Asami and Iroh go after an airfield we didn’t even know existed at the start of the episode, they each encounter obstacles but overcome them and win fairly easily. There isn’t even time to give Iroh any character. He’s just this cool action guy related to a character in the original series and voiced by the same actor – little more than an easter egg for fans of the original show, not really a character so much as a plot device with a big “win” button on his forehead. This is all still true. I think that really, they needed another three episodes at least to really give a meaningful ending; that or they let the characters hit rock bottom earlier in the series, condensing the pro-bending elements and bringing Amon in as a serious threat earlier (the writers could, for example, have skipped the pre-championship problems and have Korra join the team for the second match of the initial stages of the championship, rather than months before, then have the semi-finals and finals in one episode, with Amon’s big entrance at the end of that). Though Amon is constantly a step ahead of Team Avatar and allies, it’s only ever one step. They’re always close behind. There’s always the impression that Korra just needs to get lucky, that one piece of info or lucky break will give them the advantage they need to defeat Amon. Even when the United Forces Fleet is destroyed and Sato’s biplanes come into play, there’s never quite the feeling of hopelessness that is intended. As such, the victory feels empty. It feels like it was inevitable. Of course, it was inevitable because this is a kid’s show and Korra and her friends are the heroes, but it never felt, at any point, like there was any way they could fail, even when at their lowest. When things went wrong, they soon went right again. The victory wasn’t really won. The characters didn’t have to chase it, it was standing still and they just had to locate it and eventually, if they kept moving, they’d reach it. The best endings are those which feel deserved, which feel hard-won. They are the endings which the heroes had to fight for, had to struggle for, even though it felt hopeless. With Legend of Korra, it never felt hopeless. There was never the sense of a prolonged struggle. Allow me to compare this to Zuko’s story arc in Avatar: The Last Airbender. Zuko struggled. In season 1, he was all determination and trying to come to terms with his loss – of his honour, his home and his family. He was a messed up teenager fixated on the one thing he could use to buy back what he’s lost: Aang. In season 2, we see a different side to him. He is often confused. He genuinely tries to be a good person, but is rejected. He finds a different way, a happier path – acceptance that he might never achieve what he wants and a sense that he doesn’t need it to be happy. At the end of season 2 and early season 3, he faces confusion and a choice – to hold onto that self-acceptance and happiness, or to return to his old dream. He makes his choice, but it doesn’t sit well with him. Eventually, he turns his back on what he always thought he wanted to do what he knows to be the right thing. This isn’t his first opportunity to do the right thing – he’s had a few before. He released Appa instead of using him to find Aang, but then returned to his happy life with Iroh at the tea shop. He could have sided with Aang and Katara – and Iroh – against Azula, but chose to return to his old dream instead. But in the end, Zuko got there. He got where he needed to be and became a better person for it. The whole series, we know he has the potential to be a good person, to be Aang’s friend, and each time he turns away. His journey is a struggle, and when it finally turns out right he’s a stronger person for it. His arc is complete – yet even in The Promise, the comic which follows the series, there remains some characters growth for him. With the ending of The Legend of Korra, there isn’t this struggle, this sense of facing different experiences and learning from them and changing gradually as a result. None of the characters really change. And in the end, there isn’t the strength of struggle needed to make the ending work. This has deviated from the topic of pacing and into the next point about the unsatisfactory ending, but it’s linked; the finale was rushed, and as a result the ending was weak. The pacing overall, episode to episode, was not awful, but over the course of the series it left the ending too squashed to really make it as strong as it could have been. Aside from what I’ve said above, I wasn’t too impressed with certain particular plot points of the ending, notably Korra being able to air bend after her other elements are blocked by Amon. I honestly think this was a very weak plot device. It hadn’t been set up. Korra hasn’t gained any spiritual insight over the course of the series, and it’s been established that her frustrations with air bending are linked to her spiritual weaknesses. Here’s where I can link this back to the problem with the core conflict of the series: if the writers had added depth to the problem of oppressed non-benders and shown Korra that side of the argument, they could have linked this with spiritual growth through wider understanding, and used that to justify her ability to air bend when the others were locked. Though not, perhaps, straight away. 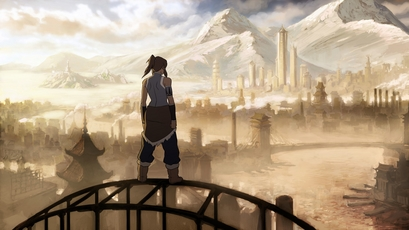 Korra losing her bending should have been the rock bottom; here she gains new insight, sees the different perspective that non-benders have lived with all their lives, and finally cracks air bending, allowing her at last to face Amon and defeat him. That would have made a more powerful ending, I think. What I said I liked last time around hasn’t changed – Amon is a pretty cool and scary villain, and the way the writers have chosen to tell a new story, with new characters and new challenges, set in a world which has changed in the intervening time. That’s all good. I’ll add to that the music. The soundtrack for the series was absolutely staggering, with some really beautiful themes and generally brilliant sound direction. Can’t fault them on that. I briefly mentioned, last time round, that I didn’t feel Korra had the light-hearted tone and humour of Last Airbender. The original series had some genuinely funny, well-pitched humour; in The Legend of Korra, though, it did not fit in so smoothly, mostly focused on Bolin being generally stupid or naïve or tactless and leaving the other main characters far too serious all the time. It is, generally, a more mature and more serious show than its predecessor, and what attempts there were at humour frequently fell flat. Mako is frequently criticised as being rather a bland character; and while I didn’t particularly notice the first time round, it is true he’s a bit flat, really just a romantic hero without anything much about him that stands out. There was the time in the series to give him more personality – not to mention the other characters – but this wasn’t done. I don’t like love triangles. They’re tired and a very superficial and manipulative way to generate conflict in a story, especially when there isn’t the time to develop them properly (I’ve been watching the Sharpe TV series recently and it happens in Sharpe’s Revenge too; I hate it there just as much as in Legend of Korra, though partly because almost every fricken woman in the whole damn series wants to sleep with Sean Bean at some point. Poor Frederickson has a point.) So the love triangle aspect is one I’d rather was missed out. I’d rather Korra didn’t have any romantic involvement at all. But when there’s a teenage girl as a protagonist, for some reason a romantic subplot is always required. The Last Airbender had some romantic subplots I wasn’t too happy with either. It’s fine for Sokka, who after all is a teenage boy, but Aang’s 12, for goodness’ sake. Oh, something that struck me on second watch-through. Amon’s not really thought very far ahead: the city is an early modern city that runs on electricity. The electricity plant is powered by lightning benders like Mako. If Amon takes the bending of all those lightning benders, where will their electricity come from? They haven’t developed the technology to produce reliable electricity without lightning benders, or they’d have used that instead of employing highly skilled and specialised individuals (who would thus cost a lot to pay). I guess I haven’t really changed my mind on anything I said before, but I did enjoy the second watch through more than the first. There are some serious flaws with the series, and I think if the same plot had taken place across 24 episodes instead of 12 these issues would have been better addressed, including pacing, the ending and the moral and spiritual questions around the oppression of non-benders. Plus they could have had time for some of the more light-hearted types of side plots seen in The Last Airbender. I suspect part of my earlier low opinion of the series was in contrast to The Last Airbender. The original series was one I enjoyed immensely, but on rewatch I can see its flaws. With the Legend of Korra, on rewatch I can better see its redeeming qualities. On re-evaluation, I raise my rating to 6/10. It still has some serious flaws right from conception of the plot to delivery of the series, notably the finale, but overall the series is enjoyable. Now to see what they do with season 2. The visuals, at least, promise to impress.